The Video Report on The Reason for My Life is a documentation on Senstad's installation and happening at The Eva Peron Museum/Museo Evita in Buenos Aires Nov 25-29 2009, in collaboration with VIBA Festival. de- and re-construction of words and language (English, Spanish and Chinese). The project was curated by Andrew Utt and produced by Carolina Montejo. 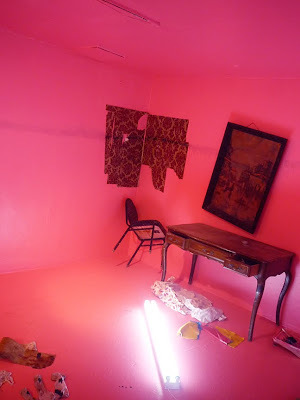 Senstad’s installation Diaspora USA Chapter is based on the remains of a hurricane Katrina damaged shotgun cottage in New Orleans. 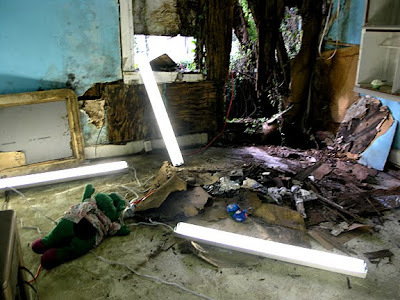 The original derelict cottage is the home of Senstad’s site specific installation The Light House at KK Projects, curated by Koan Jeff Baysa 2007/08, and the source for the video piece, Light Writes Always in Plural – Section Three, 2009. The video trilogy Light Writes Always in Plural – Section One, Two and Three is projected onto cardboard boxes, a suitcase and rubble in the space. “The items used for the installation are arranged from memory of the remains of that particular cottage, and I have collected objects and paraphernalia from local sources that recreate a social/economic status of the displaced inhabitants”, says Senstad. The walls serve as the exterior of the cottage with a floodwater line and spray painted inspection signature that still remains in New Orleans to this day. TFW (which stands for Task Force Wildcat – a national Guard Unit) with indications of date of inspection, number of dead people found in house, number of dead people removed from house, and name of agency that performed the inspection. The 4 ft office lights are arranged in a similar pattern as in the video and original installation. The objective for reference to the original installation, is based on aesthetic documentation and re-use of materials as a source for this new installation.